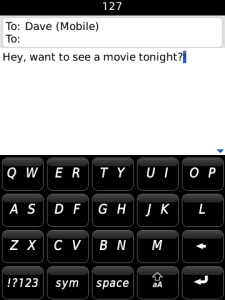 Want faster texting on the BlackBerry Storm/Storm2? Qtext is the answer. Qtext features 10 slots that are easily linked to any 10 contacts in your address book. Once setup, simply click the corresponding text button next to the contact and it automatically brings up a blank text message with their mobile number already loaded in! Numbers can be quickly and easily changed at any time. No more working through tons of screens just to send a simple text message to someone. Move Qtext to your home screen and sending a text to your most frequently used contacts is just 2 clicks away! IMPORTANT After installing Qtext, make sure to disable compatibility mode for the app. This can be found under Options Applications highlight Qtext Menu button Disable compatibility mode. This will ensure proper functionality of the app.